The Zmodo Replay includes a four channel NVR, four pairs of indoor 720p HD Wi-Fi cameras, and their power supplies. Remote access is supported, allowing you to monitor and protect your home, family, and property from anywhere of the world. With a compact design, you can place the cameras virtually anywhere. 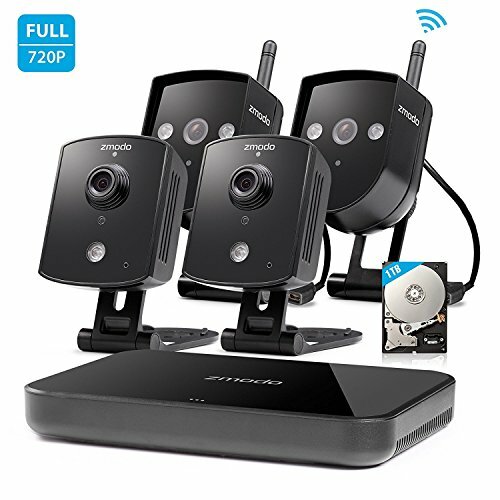 Set up cameras near entryways or anywhere in your house to monitor what is happening day and night. Capture every moment to the NVR’s pre-installed hard drive. Versatile mounting brackets and WiFi camera connection allows for unparalleled ease of installation and allows you to place your cameras in the optimal positions to capture footage.